A minimum wage increase for Iowa? 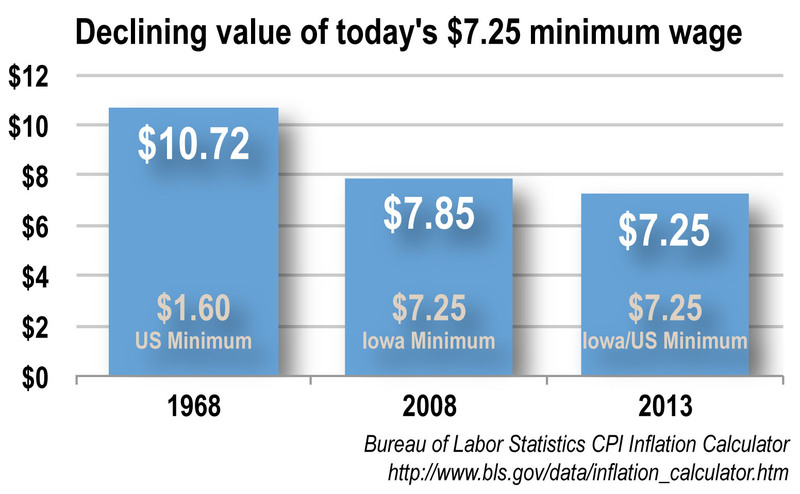 Many forget that in Iowa, the pressure for a minimum-wage increase has been building longer than it has nationally. The question is an old one. Sadly. Every few years, the pressure builds enough that we finally get a discussion about raising the minimum wage. We seem to finally be reaching that stage. The president supports a $10.10 minimum, up from the current and outdated $7.25 per hour, as Senate Labor Chair Tom Harkin of Iowa proposed last February. And it’s grown in popularity, if not in paychecks of the working poor. A Washington Post poll finds two-thirds of Americans support a minimum wage increase, and a firm majority — 57 percent — believe federal policy should be used to reduce the wealth gap between rich and poor. Many forget that in Iowa, the pressure has been building longer than it has nationally, as IPP’s Heather Gibney pointed out last March. Yet there’s no assurance we’ll hear much about it in a promised short session of the Iowa Legislature in 2014. Iowa actually beat the feds to the punch in 2007, raising the state’s minimum wage to $7.25 in January 2008, a full year and a half ahead of the federal wage increase. That means six full years have eroded the buying power of those at the minimum wage — effectively, a 60-cents-per-hour wage cut. Given the lack of assurance of this being addressed in Washington, and even less of it being done in a nonpolitical manner, raising and indexing the wage to inflation as the Gazette suggests would be an effective way of ending these periodic squabbles that leave pay for the working poor to “political winds and whims.” Can our Governor and Legislature begin to look at the issue that way?